Click pause || to turn off. Adventures of Great Joy & Aliveness! In the Spirit of ALOHA! of magical living... It all begins with imagination. Dolphins are the most loving, intelligent, playful, joy-filled, evolved creatures I have ever experienced on earth. They communicate with each other from several miles apart and when sleeping, they close down one side of their brain. Through their sonar, they receive a bio-magnetic readout (picture) of the health and well-being of the life around them. They are conscious breathers, meaning their every breath is something they do consciously, with thought and intention. Their reputation as powerful healers is spreading across the globe. Many who have had contact with dolphins experience radical shifts in many areas of their lives. Fulfilling a life-long dream of swimming with dolphins in their natural habitat, evolved into Ecstatic Dolphin Journeys. The type we most commonly see here in Hawai'i is the Hawaiian Spinner Dolphin, named for their spinning jumps out of the water. Also commonly seen in Hawaiian waters are the Bottlenose and Spotted Dolphin, less common are the Rough-Tooth Dolphin. We have had some amazing encounters with them as well. 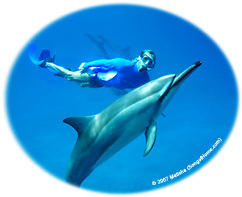 See Dolphin Photos. They recognize us and are usually quite interested, even excited to meet our friends. The aquamarine, protected bays offer some of the most beautiful snorkeling in the island chain and are home to many wild Spinners who come to rest, mate, and play. Over the years, we have developed a close relationship with many of these dolphins. We notice our strength and endurance increases, we are never cold, and are actually warm, (even after feeling cold), when the dolphins are around us. Sea turtles, (they 'fly' under water) tropical fish, and other oceanic wonders live here as well. Dolphins live in expanded awareness and are as emissaries and bridges for the new consciousness being birthed on our planet. There is nothing like bathing in their ecstatic song! It is an immense delight to share all of this with you, who feel called to be here. Here in Hawaii, the dolphins come into the shallower water during the day to rest, mate and play. It is important to their well-being that they be allowed to sleep and rest hence, we give some information on Dolphin Etiquette and sensitive ways of being while in their home. If you see people chasing, following or attempting to touch the dolphins, please let them know we have an agreement to 'give the dolphins space,' we swim with our arms to our sides, and we don't chase or follow them around. This is important... there are people who don't want anyone to be allowed to swim with the dolphins. Thank you for remembering, when you are in the ocean you are in the dolphins' home and it is important that they get their rest. We are available to do dolphin journeys for half days and multiple days. If you are choosing to come to Hawai'i and hope to be with the dolphins and/or whales, and do other activities, let us know. We will customize an experience with you. See you here in Hawai'i! We suggest going out in the morning. We suggest leaving the dolphins to rest in the afternoons. The ocean journeys are often around two hours. We often meet between 7 and 8 am, depending on what you choose. 2. Kayak Journeys... Some like to have a floating island, (the kayak). Remember, while in the ocean, we have fins on our feet so, even people who aren't strong swimmers will be able to get around with relative ease. Snorkel instruction is available. The journeys are tailored to the individual's desires, comfort level in the ocean and physical abilities. These creatures are angels of the sea! Please take a moment and read about the latest set of amendments that threaten the Marine Mammal Protection ACT (MMPA), which would allow the use of the U.S. Navy's Low Frequency Active Sonar (LFAS) (which is known to injure and kill marine life and make it diffucult for dolphins and whales to use echo location for navigation and feeding). It may have appeared as a "PopUp window" once SongofHome.com's homepage loaded. Click here for more info. and thank you for your assistance! We suggest making reservations sooner than later so you have more options. Boat Charters ~ These are high-level, fun and life-changing ocean journeys...Conscious Dolphin/Whale Interactions! Our dedicated crew is made up of energetic, helpful, sensitively-attuned people to the Cetaceans (dolphins and whales). With years of experience communing with, observing and being around these beautiful beings, it is a great joy for us to share this once-in-a-lifetime experience with all who feel called to join us! This journey is for you! This is a personally-tailored experience. A four hour journey to experience the Cetaceans, the ocean and all who greet us... Plenty of shade & sun on-board. Dry spaces for cameras, etc. Please pack lightly. We suggest keeping a little time open after the trip to stay out longer if we're having too much fun and/or to integrate after the experience. Refreshments provided. Sometimes the boat trip is video-taped and is available for purchase. Sometimes hydra-phones (underwater microphones) are on-board so we can hear the Humpback whales singing. January, February and March are often peak months for seeing Humpback whales in Hawai`i. Kayak and snorkel gear rental is extra. For Kayak Journeys the group maximum is usually between 11 & 15 people. 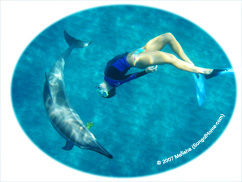 Shore Swims ~ Snorkel along Kona's pristine coastline and explore the home of the dolphins and whales...breath-giving oceanic sites... (the experience may last 1.5 - 2.5 hours) Kayak and snorkel gear rental is extra. We suggest renting or buying a mask, snorkel and fins. In some instances snorkel equipment may be available. To combine a Shore Swim & Land Journey on the same day is possible. Waterfall Trips to gorgeous waterfalls, both more private and some public though, with little-traveled spots are a highlight of being on The Big Island. All these journeys are fashioned to the individual(s) participating in them. Any questions, considerations, suggestions...please let us know. Thank you! Discounts available when booking several Journeys (3 days or more) or small/large groups. 1. Cat = Cats usually don't like being in the water. 2. Dog = Comfy in the water, swim pretty well though, they may not have too much stamina. Are you a beginning swimmer (like a cat), intermediate (like a dog) or advanced swimmer (like a dolphin)? It helps for us to know so we can best serve you. We are looking forward to sharing beautiful, life-changing experiences with you! go toward supporting Ecstatic Journey Home (A Ministry for Love). Here are some of the dolphin photos. Important information for Kayak Use - for those doing kayak journeys. If the table of links below does NOT display, click here or go to bottom of page. for the table below to display and the links to work. If so, a message may appear asking if you want to install the plug-in. Installing the plug-in will enable dynamic content on this and other web pages. Dolphins are protected (in theory) by the Marine Mammal Protection ACT (MMPA). It basically states not to approach a marine mammal within 150 feet (approximately 50 meters). #1. Please treat dolphins, whales and all sea life the way you might like to be treated by someone in your bedroom, whom you just met. PLEASE...do NOT attempt to touch the dolphins. We have seen countless times people who have ended their dolphin encounter by attempting to get too close too soon. Each one of us in the water sets an example for others in the area, who may NOT be familiar with "how to be" in the presence of wild dolphins. We have spent years developing trust with these animals. They come close because they "want" to and choose to. Give the dolphins space. Let them live, experience and express themselves freely without having to look out for swimmers, kayaks, boats, etc. When a lot of activity is happening around the dolphins, (when they're in rest-mode) it is no longer a "restful zone". It can put them in the position of having to be on guard. That being said, it has been our observation that they often rest in areas where there are boats and other ocean activities happening, however, they are allowed to rest and are not being pursued. They come closer to shore to rest, mate and play. When they are resting it is very important to "allow them to rest" so they can be well-rested and alert while hunting and protecting themselves in the deep sea. If you're not sure what mode they are in, please "watch", learn and ask several people who are familiar with wild dolphins how they know when the dolphins are resting. One of the most prevalent tendencies has been for humans to bring their "life-on-land" approach to perceiving the dolphins and creatures of the sea. Many things on land simply don't translate to the ocean and lifeforms therein. For years there has been controversy around the issue of humans and dolphins interacting. The more we regulate our own activities and let others know about dolphin etiquette, perhaps the less regulations will come from the authorities. How many places have you seen get closed-down or heavily regulated because people couldn't/didn't choose to live sensitively and sensibly with the freedoms they had? Please have a good look at the Dolphin & Whale Alerts. They appreciate our help. #2. Don't chase the dolphins or follow them. Please allow them to come to you instead of following them. We have observed for years how when people simply float they often get a much better view of the dolphins, i.e., see dolphin faces as opposed to their tails. If you really want to have a good look at them, hang out and allow them to circle. People who swim after the dolpins invariably get pooped on. It is very obvious when they choose to interact. Like humans, they don't always feel like having company. If you're looking at dolphin tails and are still swimming, that's when you know you're not swimming "with" dolphins, you're swimming "after" dolphins. Notice your position in relationship to the dolphins...allow them to come to you. There are those who swim with dolphins and there are those with whom the dolphins swim. #3. Please show sensitivity to them while in their Homes. Most people wouldn't go into someone's home they don't know and follow or chase them around. It is very exciting to be in the presence of wild dolphins though, we ask that people be gentle and "observe" the dolphins"... Please treat them the way you'd like to be treated in your home by someone you haven't yet met. We match their behavior. When they are quiet and to themselves, we are as well. It's pretty simple...probably the same consideration most of us appreciate from others. #4. Swim with hands to your sides or behind your back. Be as a dolphin...one way to join them, to connect with them is by "feeling" as though you are a dolphin. #5. When you see someone having an interaction with a dolphin or dolphins, please give them space. Swimming or paddling into the area, splashing, loud voices can put an end to their interaction. Use the same or more sensitivity you like others to exercise with you. Beam love to them...they respond to love, kind thoughts, beautiful images, geometric shapes, things out-of-the-ordinary. They often respond favorably to women and children...(anything but ordinary). Men, we encourage you. Many humans appear to be sleeping because many humans operate from one side of the brain. Dolphins sleep by closing down one side of their brain. If you're attempting or believing you "know" what is happening with the dolphins, you might be "in your head". Left-brain thinking may be comparable to a sleep-state for a dolphin hence if you're in your head, they may stay away out of "consideration" for you during your sleep. We have repeatedly observed how strongly dolphins are attracted to children and infants.